Mr. Adam Bradley of Madera Sculptures, our temple carpenter, just completed construction of our new Torii gate. Over the past 9 days, we completed 3 major projects. The attached pictures are of the finished projects. 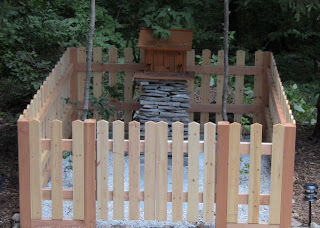 Construction of the Tamagaki Shrine Fence: Adam san constructed a traditional tamagaki fence to surround the shrine. Each premium white pine slat had to be cut at the exact prescribed angle and this project took a full 5 days. The posts were constructed from Douglas Fir. Construction of Torii Gate: This is the project we are most excited about. We found the perfect sacred tree and made the special offering before cutting. The tree was a standing dead tree with beautiful turquoise lichens growing on the bark. We had to build to precise specifications and we hit several snags and Adam san had to rework the design. Ultimately we chose the more rustic Kuroki style Torii. The Nuki lower cross beam, was hand milled by Adam san from the same tree. Later we will build the more elegant Myojin style Torii.